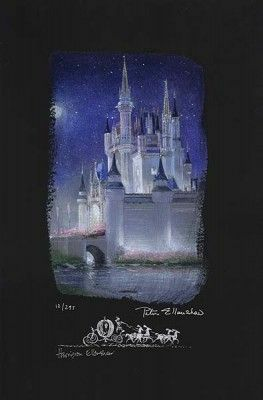 Home | Serigraphs and Giclee Fine Art | Peter Ellenshaw | Peter and Harrision Ellenshaw Disney Editions | Peter and Harrison Ellenshaw Individually Hand Numbered Limited Edition Chiarograph on Black Paper:"Cinderella Castle"
Peter and Harrison Ellenshaw Individually Hand Numbered Limited Edition Chiarograph on Black Paper:"Cinderella Castle"
Edition:Artist Hand Signed and Numbered Limited Edition to 295 General edition (As Shown) and 95 Deluxe Editions - Select Option Above. About the Artists: Introducing the Collaborative Art of Peter and Harrison Ellenshaw. Home | Fine Art Prints & Limited Editions | Collectors Editions | Disney Fine Art | Peter Ellenshaw | Peter and Harrision Ellenshaw Disney Editions | Peter and Harrison Ellenshaw Individually Hand Numbered Limited Edition Chiarograph on Black Paper:"Cinderella Castle"
Home | Disney and Animation Art | Disney Fine Art | Peter Ellenshaw | Peter and Harrision Ellenshaw Disney Editions | Peter and Harrison Ellenshaw Individually Hand Numbered Limited Edition Chiarograph on Black Paper:"Cinderella Castle"
Home | Fine Art Prints & Limited Editions | Collectors Editions | Peter Ellenshaw | Peter and Harrision Ellenshaw Disney Editions | Peter and Harrison Ellenshaw Individually Hand Numbered Limited Edition Chiarograph on Black Paper:"Cinderella Castle"